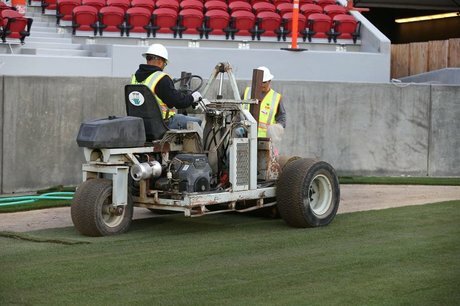 The Santa Clara Stadium Authority and the San Francisco 49ers have selected West Coast Turf’s Bandera Bermuda for the playing field at Levi’s® Stadium. Installation of 2.5 acres of sod is set to begin the morning of Thursday, April 17. “Once you step foot on newly planted grass within a newly built stadium the entire experience is suddenly a little more tangible,” said West Coast Turf’s local representative Greg Dunn. After extensive research and side-by-side simulated turf trials, Bandera Bermuda was selected as the go-to variety. Many factors influenced the selection of Bandera Bermuda: environmental conservation, macro/micro-climate, frequency of additional event scheduling, and player safety. Bandera Bermuda uses up to 50 percent less water than the average turf varieties prevalent in this market area. It holds its green color longer and has a longer growth period than any other available bermuda. Bandera Bermuda also exhibits the quickest growth regeneration in worn areas when compared to other varieties of grass. When the 49ers take the field for their first preseason game later this year, the countless hours of planning, mowing, fertilizing, watering, and painting will have all been completed. Head groundskeeper Matt Greiner can be confident in the fact this field will match the standard of performance the 49ers are accustomed to. All 21st century professional athletic fields are formulated with a United States Golf Association or similarly engineered sand as the base upon which the sod is installed. The base is largely coarse and medium sand with trace amounts of clay, silt and organic peat. This scientific base promotes deep, vigorous root growth. When coupled with a state of the art drainage system, this synergy allows for movement of water through the field when heavy rainfall typically would have inundated previous soil based fields and ensuing play would have exacerbated the damage. The field at Levi’s® Stadium was chosen to minimize the factors which jeopardize solid footing and playability. Although the 49ers home opener has not yet been scheduled, the field’s first action will feature another hometown team - the San Jose Earthquakes - in a soccer match versus the Seattle Sounders FC on August 2.